You are here: Home / Uncategorized / Futbols! The mountain ranges of the Lebialem Highlands in Cameroon are picturesque. “The valley”, as ICA members like to call it, is characterized by lush jungle, rolling hills and free flowing streams and rivers. However, the features that make the Lebialem Highlands beautiful are also the same features that make it formidable. The mountains act as natural barriers, which create remote and isolated communities. All ICA volunteers can attest to the difficulty of climbing and descending hill after hill, hour after hour, all the while enduring the ferocious heat and humidity! A footpath that takes an ICA “delegation” or “entourage” five hours to hike can take the locals a mere one hour. This is impressive, especially given the fact that some Cameroonians can hike all day in shower sandals. This simple observation – mountains and sandals – points to the resiliency of the local population. They are accustomed, well adapted and undeterred by their environment. If they want to accomplish something, it will get done. This applies equally to the children who want to play football! The first time I went to Cameroon in 2011, I noticed that every primary school has a football field. Each field exists in spite of the school’s location, which is normally at the edge of a valley or squarely on the side of a mountain. A handful of schools are lucky enough to have a flat field, but most take on the characteristics of the region. The fields have undulating hills, spiked rocks and curved surfaces. At GS Tchougui, the field is on a steep incline. This gives a distinct advantage to the team that has the high ground. At GS Njilap, which is positioned on the side of an escarpment, the field is littered with boulders. It’s not even a “field” in the normal sense of the word. At the secondary school G.T.C. Njenawung, the football pitch bends 20 degrees at midfield, so that the two nets are facing midfield but not each other. That being said, the fields are the least of the children’s concerns. The biggest challenge is acquiring a football that can withstand such rigorous terrain. In Cameroon, just like elsewhere in the world, footballs get beat-up and deflated in no time. Even official balls are not designed to endure the daily punishment of the rough conditions of the pitch coupled with 30 or 40 football-impassioned children! That being said, “No Dragon Too Big” is ICA’s unofficial motto. That’s why in 2014/2015, ICA partnered with One World Play project, an organization that believes that “play” is the best way of uniting communities, promoting exercise, breaking down gender barriers and, in general, allowing kids to be kids. 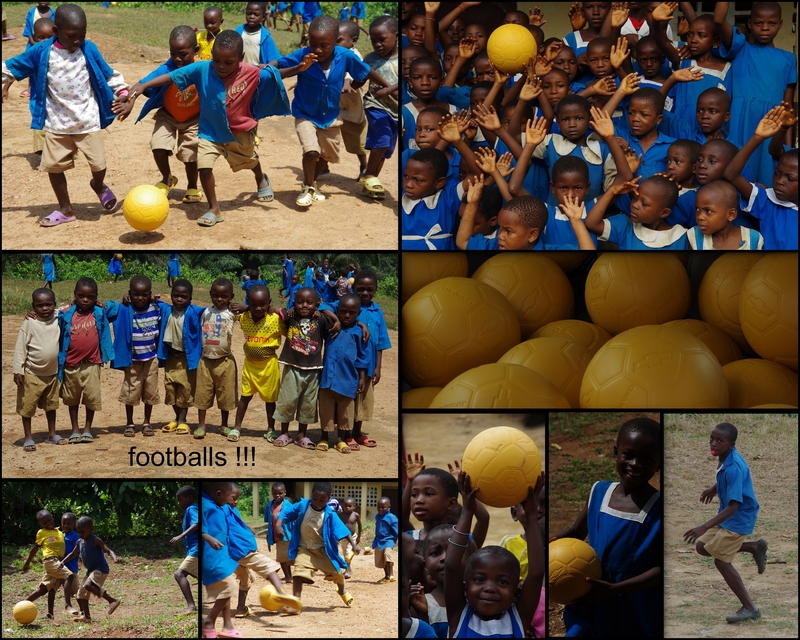 One World Play has designed an ultra-durable football they’ve coined the “One World Futbol”. It doesn’t require inflation and always maintains its form. In 2015, ICA obtained a shipment of 1000 Futbols and shuttled them in a van from Buea to Lewoh – about a 6 hour drive. When people saw the van, which was filled window-high with footballs, their facial expressions were priceless! Needless to say, at the rest stops we had to turn down more than a few requests for donations! The balls were destined for the Lebialem school district, which consists of about 150 schools. Each school would receive five balls and the remaining balls were presented to the Permanent Secretary for Basic Education (a long time partner with ICA) for distribution to schools in other regions. The donation ceremony was held at Menji-Fontem (big Menji) and was widely attended by officials and the local population. The balls were a spectacular hit! ICA members returned to the valley this year and witnessed the children still using them. Not only is this a validation of the quality and value of the Futbols, but brings a feeling of satisfaction that is not easily described. ICA understands that a single donation of materials is rarely a good development strategy, but nonetheless, we are more than satisfied that these Futbols will continue to bring smiling faces to those asymmetric fields for years to come! https://icacanada.org/wp-content/uploads/2018/12/ICA-Logo.png 0 0 ICA Canada https://icacanada.org/wp-content/uploads/2018/12/ICA-Logo.png ICA Canada2016-07-23 13:00:362016-07-23 13:04:34Futbols!